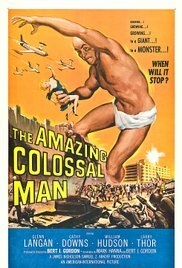 In my series on the history of science fiction, I am looking at films made in the Golden Age. 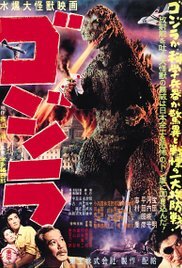 Some films played on the fear of nuclear energy and the power it had to mutate: It Came From Beneath the Sea (1955), The Amazing Colossal Man (1957), The Incredible Shrinking Man (1957), The Fly (1958), and the most enduring, Godzilla (1954) from Japan. After an encounter at sea with an unknown underwater creature, a naval commander works with two scientists to identify it. The creature they are dealing with is a giant, radioactive octopus that has left its normal feeding grounds in search of new sources of replenishment. As the creature attacks San Francisco, the Navy tries to trap it at the Golden Gate Bridge but it manages to enter the Bay area leading to a final confrontation with a submarine. Scott Carey and his wife Louise are sunning themselves on their cabin cruiser, the small craft adrift on a calm sea. While his wife is below deck, a low mist passes over him. Scott, lying in the sun, is sprinkled with glittery particles that quickly evaporate. Later he is accidentally sprayed with an insecticide while driving and, in the next few days, he finds that he has begun to shrink. First just a few inches, so that his clothes no longer fit, then a little more. Soon he is only three feet tall, and a national curiosity. 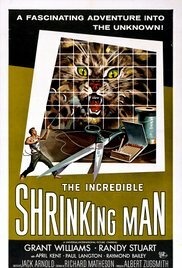 At six inches tall he can only live in a doll's house and even that becomes impossible when his cat breaks in. Scott flees to the cellar, his wife thinks he has been eaten by the cat and the door to the cellar is closed, trapping him in the littered room where, menaced by a giant spider, he struggles to survive. After her husband Andre Delambre is crushed to death in a mechanical press, his wife recounts to his brother Francois Delambre and police Inspector Charas the events of the previous few months. They were very much in love and with their little boy, a very happy family. Andre was experimenting with teleportation - transporting objects from one point to another by breaking the object down to the atomic level and then reassembling it in a receiver a distance away. The system had some glitches - it seemed to work with inanimate object but his cat disappeared when he tried teleporting it. He thinks he's solved all of the problems with his invention and decides to try and teleport himself. 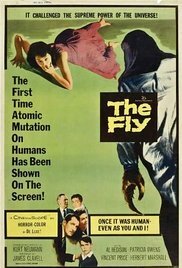 When a fly enters the teleportation device with him, disaster strikes, and he accidentally exchanges one arm and his head with that of a fly which was in the transfer chamber.